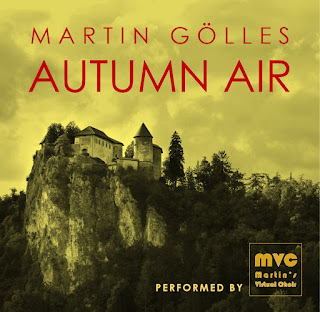 Hi, I'm Martin Gölles, conductor and composer from Hungary. I'm very interested to bring singers together for a virtual or online choir from different parts of the world. I'd like to make an attempt, how can we perform my chorus piece "Autumn Air". If You are interested to take part in this project, please watch and listen to one my videos (soprano, mezzosoprano, alto, tenore or basso), learn Your part, pick up the headset and make a video about Your singing. Upload this video to YouTube (video title: Your name, part and Your location) and send me the link to martinsvirtualchoir@gmail.com. Or make a sound file and send it to this same e-mail address (with the same way: name, part and location, but in this case please send also a foto of You in the attachment, so I can put Your face to the members of the virtual choir). The extended deadline will expire soon, but You can still send Your parts during the year of 2018, thereafter I'll bring Your parts together, make the recording and upload this song to my blog and other sites. For sheet music click here!